A revolution in home gardening. Picture automatically taken by a GrowBot and sent to its owner. 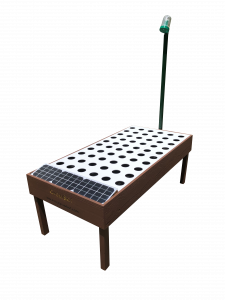 GrowBot is a revolutionary line of residential solar powered fully automated hydroponic edible gardens. Everyone who cares about consuming fresh quality produce regularly should have a Growbot and this is why. 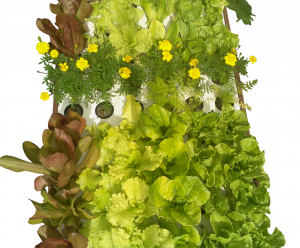 Imagine a fully automated robotic garden that can grow a wide variety of fresh vegetables, herbs and flowers without requiring you to do any form of weeding, digging and watering like with typical traditional gardens. This is literally the only all-encompassing automated garden in the market today designed for residential use. This groundbreaking food growing robot which are the size of coffee tables can grow up to 60 plants simultaneously without the use of harmful chemicals like pesticides, fungicides and herbicides. All you need is sunshine, a wifi connection and a water hose. We’re able to achieve this mind-boggling feat after spending well over 8 years perfecting this garden to work on almost any patio or yard. The benefits are amazing. What you get when you buy a GrowBot: GrowBot computer, camera, solar-powered batteries, solar panel, 6 circulation pumps, 3 water hoses for circulation, water distribution system, 3 feeding pumps, 3 water valves, 3 nutrient reservoirs, 60 net pots, 3 water sensors, 3 trays, 3 tray tops, and a durable cedar and redwood frame with legs. This is the bottom line. 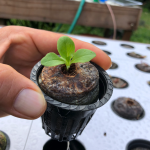 GrowBots use 90% less water, 70% less fertilizer, 1/5 the land, extends growing season, speeds up growing by 30%, fully solar powered, no weeding, no digging, no watering, no feeding, it sends you an email with what is growing, and has fully automated remote upgrades. Affordable, currently we are selling them on mygrowbot.com for $399. The gardens can be fertilized using naturally sourced or organic fertilizers so no soil runoff, no fertilizer runoff, no wasted water, no herbicides. Whats good for you is good for our planet.